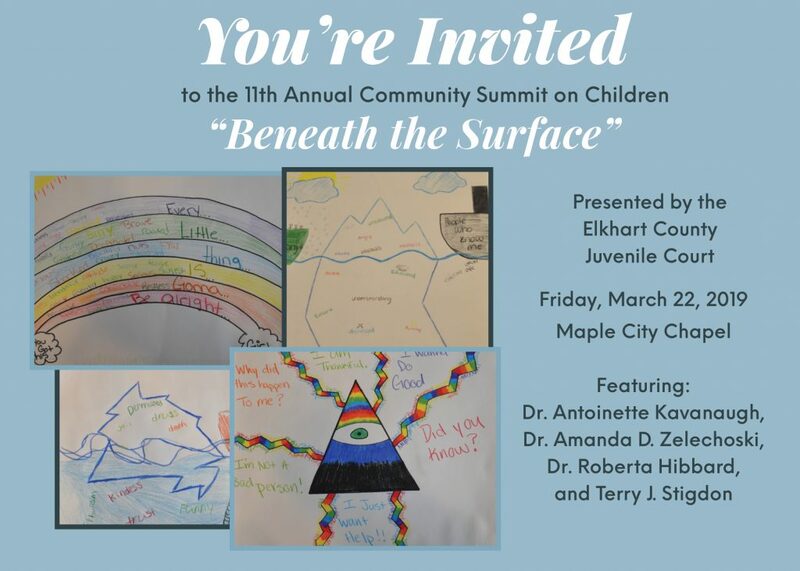 Join us on Friday, March 22, 2019, for the 11th Annual Community Summit on Children, “Beneath the Surface,” presented by the Elkhart County Juvenile Court. Registration is $25 per person which includes lunch and CEUS. 8:30-8:45 a.m.: Opening remarks on why it is important to look beneath the surface when dealing with the needs of children who are involved in juvenile justice. Magistrate Deborah Domine, Elkhart Circuit Court, Juvenile Division and Pastor Jay Shetler, Maple City Chapel, Ph.D., HSPP, Psychologist. 8:45-10:15 a.m.: Youth and Trauma: Things Are Not Always What They Seem. Dr. Amanda D. Zelechoski, J.D., Ph.D., ABPP, and Dr. Antoinette Kavanaugh; Ph.D., ABPP. This presentation will review aspects of youth brain development that are particularly impacted by trauma and provide examples to demonstrate ways that traumatic experiences can manifest in youths’ emotional and behavioral functioning and emphasize the·importance of obtaining an accurate understanding of a child’s trauma exposure. 10:35 a.m. – 12:05 p.m.: Continuation of Youth and Trauma: Things Are Not Always What They Seem. Dr. Amanda D. Zelechoski, J.D., Ph.D., ABPP, and Dr. Antoinette Kavanaugh, Ph. D., ABPP. 12:05 – 1:10 p.m.: Lunch/Networking “I am” Exercise, Maureen P. Lorman, Education Specialist, Elkhart County Juvenile Detention Center. 1:10 – 2:10 p.m. Dr. Roberta Hibbard, M.D., Riley Children’s Hospital. Identification of the signs of child abuse. Dr. Hibbard is one of the leading experts on child abuse in the country. Her insights on the identification of signs of abuse is critical for any professional working with families and children. 2:10 – 2:15 p.m.: Perspective of a system involved youth. 2:15 – 3:15 p.m.: Terry J. Stigdon, MSN, RN is the Director of the Indiana Department of Child Services. She is at the helm in Indiana’s efforts against child abuse and neglect, and efforts to ensure Indiana’s children are safe and able to grow into healthy adults. She will talk about the DCS and about changes at the agency since the DCS underwent an extensive performance examination by the Child Welfare Policy and Practice Group.